Phoebe Smith, 12, and Melodie Loya, 13, celebrate after Phoebe spelled a word correctly during the final round of the Scripps National Spelling Bee in Oxon Hill, Maryland, on May 31, 2018. Update at 9:45 p.m. May 31: Karthik Nemmani from McKinney, Texas, is the 2018 Scripps National Spelling Bee champion. The bee came down to three kids from the Dallas area. OXON HILL, Md. — Naysa Modi did attend the festive Memorial Day barbecue that kicks off the week for competitors in the Scripps National Spelling Bee. But she left on the first bus available to return to the convention center outside Washington where the bee is staged. She blew off that evening’s opening ceremonies, too, feeling like she’d seen it all before. “I know what to expect now. I’m not that overwhelmed,” said Naysa, whose outgoing personality masks a fierce competitive drive. Follow our live blog on the Scripps National Spelling Bee on Thursday night. The 12-year-old seventh-grader from Frisco, Texas, was one of 16 spellers who advanced to Thursday’s prime-time finals after surviving five rounds that stretched over 4½ hours and were never quite difficult enough for the unflappable group onstage. The morning began with 41 finalists, and the only major surprise among those eliminated was another Texan, Sohum Sukhatankar. The Dallas native won last year’s North South Foundation spelling bee — one of the highly competitive minor-league bees that serve as training grounds for the Indian-American kids who’ve come to dominate the Scripps stage. The past 13 champions and 18 of the past 22 have had Indian heritage. 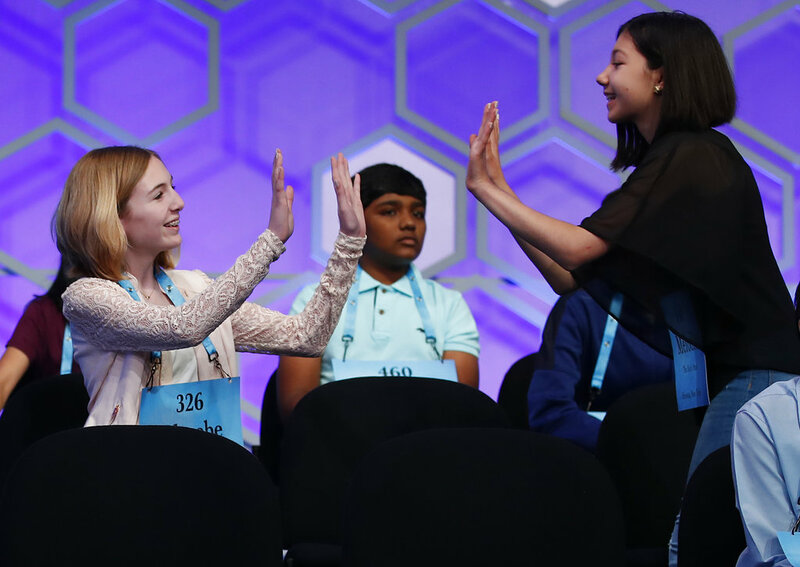 This year’s bee was bigger than ever, with 515 competitors, because Scripps launched a new wild-card program that provides an alternative path to the bee for spellers who didn’t win their highly competitive regions. Four of the 16 remaining finalists were wild-card entrants. The prime-time finals were larger than ever, too — Scripps tries to narrow the field to a dozen or fewer for the ESPN telecast. The previous record for the nighttime competition was 15, set last year. Naysa was one of three spellers who finished in last year’s top 10 who had a chance to equal or improve upon that feat. The others were 12-year-old Shuthrika Padhy of Cherry Hill, New Jersey, and 13-year-old Erin Howard of Huntsville, Alabama. All three are seventh-graders, which means they have one more year of eligibility. That’s not the case for this year’s only five-time speller, Tara Singh of Louisville, Kentucky, who made the prime-time finals for the first time. The 13-year-old is in eighth grade and this was her last shot. Five of the 16 finalists are in the bee for the first time, including the youngest remaining speller, 11-year-old Abhijay Kodali of Flower Mound, Texas. His older sister, Ananya, never made it to the bee because she kept losing at regionals to a speller who was good enough to make the top 10 — one of the inequities in the qualifying system that the wild-card program was meant to address. Two 12-year-old spellers made big leaps to reach the final 16, having not gotten past the preliminary rounds in their prior appearances — Simone Kaplan of Miami and Phoebe Smith of Aston, Pennsylvania. Twelve-year-old Aisha Randhawa of Corona, California, has something in common with Jairam Hathwar, the champion from two years ago — both are avid golfers who find some common ground among the solitary pursuits of golf and spelling. Aisha was one of three finalists who got the highest score on the bee-opening spelling and vocabulary test, and her assessment of the morning finals shows how deep Scripps will need to dig in the dictionary to determine a champion. She said she only heard one word she didn’t know. Naysa never appeared rattled, either. Her focus only wavered during commercial breaks, when she chatted animatedly with fellow spellers on stage and accepted hugs from former competitors and her mom. She got big cheers every time she nailed a word, having formed close friendships over four years of competitive spelling.